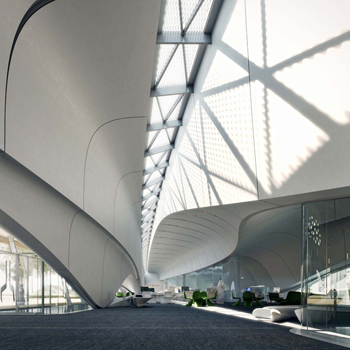 The iconic Bee’ah headquarters ... designed by Zaha Hadid Architects. As per the agreement, Antonio Citterio Patricia Viel will provide bespoke furniture, fixture, equipment and interior design services for Bee’ah’s new, iconic headquarters in Sharjah. The complex, which will be powered by 100 per cent renewable energy sources, was designed by the late Zaha Hadid, a world-renowned and award-winning architect, says the Emirati company. Bee’ah HQ ... aiming to achieve Leed Platinum certification. The landmark building will be the first in the UAE to be powered by renewable energy and is expected to achieve the Leadership in Energy and Environmental Design (Leed) Platinum certification, the green-building standard’s highest rating, it states, adding that its ultra-low carbon, minimal water consumption and efficient use of materials during construction, embody sustainable principles. Antonio Citterio Patricia Viel is a specialist in the fields of architecture, interior and urban design and renowned for its exceptional work and ranks among the most distinguished designers in the world. Its timeless, world-class designs have led to its success globally, spanning continents and catering to some of the world’s most illustrious establishments. Some of its most recent projects include the interior design of the Bulgari Hotel Beijing, located in the heart of the Embassy District in China’s capital city. In addition, the Italian group’s portfolio includes the Bulgari Hotels & Resorts in Milan, London and Dubai (see Real Estate); the Mandarin Oriental Hotel and the Ermenegildo Zegna group headquarters in Milan. “It is an incredible honour to bring our expertise in interior design principles to such a prestigious project. We have designed many acclaimed projects all over the globe but this project is unique for our company,” said its co-founding principal Antonio Citterio, after signing the deal with Salim Al Owais, the chairman of Bee’ah at the group’s office in Milan. “It will simultaneously be a landmark that will stand the test of time as well as a monument to environmental sustainability, which is among Antonio Citterio Patricia Viel’s foundational values,” he stated. Bee’ah pointed out that this signing was with yet another world-renowned entity, following agreements with Zaha Hadid Architects and Al Futtaim Carillion. It confirmst that top companies in their respective industries will be working together to create Bee’ah’s landmark of sustainability. “One of our most ambitious projects to date is our new headquarters, designed by Zaha Hadid Architects. Through this agreement, we look forward to utilising their unique aesthetics to complement the design of the headquarters to achieve our vision of creating an architectural icon of sustainability,” Al Owais said.